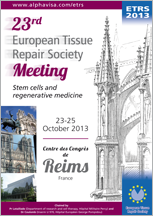 On behalf of the European Tissue Repair Society and the Local Organizing Committee, it is a great pleasure to welcome you in France for the 23rd ETRS Annual Meeting, from 23 to 25 October 2013. The Meeting will be held in Reims, an historical city in the Champagne-Ardenne region of France, at 129km (80mi) east-northeast of Paris. Founded by the Gauls, it became a major city during the period of the Roman Empire. Reims is well known for its Champagne cellars and its wonderful Cathedral. The Cathedral of Reims played the same role in France as Westminster Abbey did in the United Kingdom. It housed the Holy Ampulla (Sainte Ampoule) containing the Saint Chrême (Chrism), allegedly brought by a white dove (the Holy Spirit) at the baptism of Clovis in 496. It was used for the anointing, the most important part of the coronation of French kings. We are very happy that the industry has welcomed our ideas heartily and support the meeting not only in the exhibition hall but also scientifically during industrial forums. We strongly encourage you to visit the industrial stands and the industrial scientific sessions where we will exchange about new techniques and materials. This year we have organized several sessions in cooperation with other French societies such as the French Association for Biomaterial Development (BIOMAT), the French Society of treatment and studies of burns (SFETB), the French Society of Extra-Cellular Matrix Biology (SFBMEc) and the French Society of Tissue and Cell Bio-engineering (SFBCT). The goal of these common sessions is to enlarge our scientific knowledge and to promote exchanges with other specialties. On behalf of the ETRS Board, the Scientific Committee and the Local Organizing Committee, we would like to thank in advance all speakers and participants for their scientific contribution, as well as the sponsors and exhibitors for their supports. We hope that you will have a fruitful scientific meeting and a wonderful time in Reims.